Now just because we see an egg in this post it does not mean it is time for breakfast! One-dish meals are favorites of mine as they can combine so many great things, which ends up complimenting all their flavors. 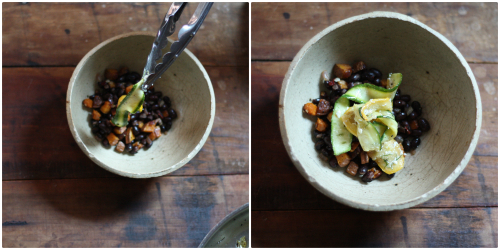 It was time to clean out the fridge this weekend so that is how this particular recipe came about! 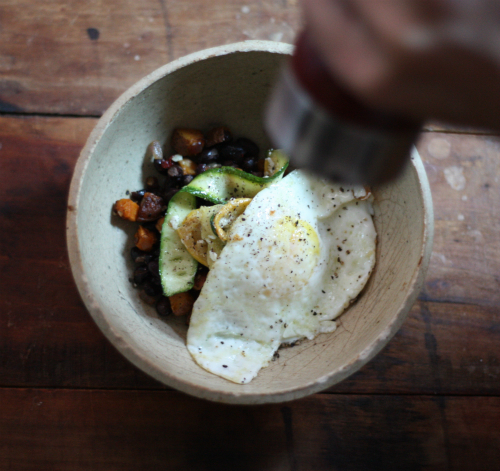 Lets get to cooking the hash: Saute the sweet potato in olive oil for 8-10 minutes. 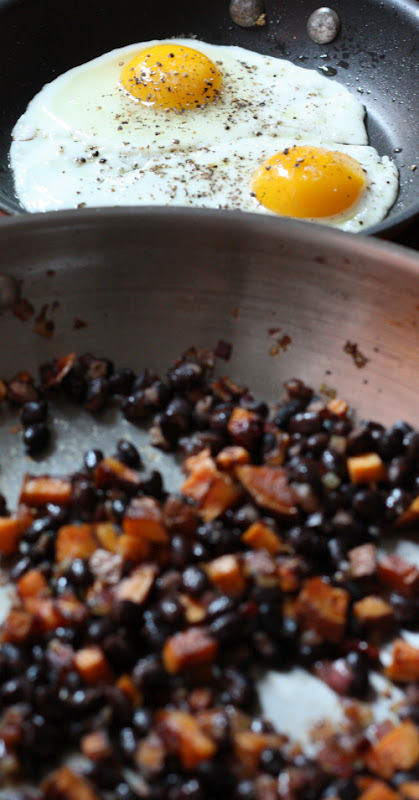 Stirring, add the red onion, garlic, black beans and chipotle — stirring again to combine. Reduce heat to low and stir occasionally to heat the beans. Squash and zucchini: Heat the olive oil and add the vegetable ribbons, stirring to heat, then add minced dill and salt an pepper to taste. 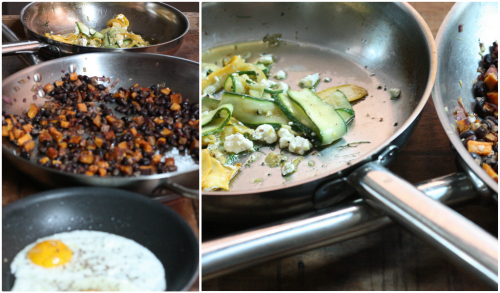 Top with crumbled feta and mix to combine before turning off the heat. Spoon some sweet potato bean mixture in the bottom of a bowl and top with several ribbons of the vegetable, making sure you have incorporated some feta. At this pont you can eat it alone or top with a couple fresh farm eggs prepared to your liking! So many flavors here, especially with the chipotle in the hash which adds a nice compliment to the feta and dill. I hope this inspires you to come up with your own one-dish meal and clean out that fridge.Your gonna love it! When it comes time to clean out the fridge, what is your go to meal to use up a bunch of ingredients? 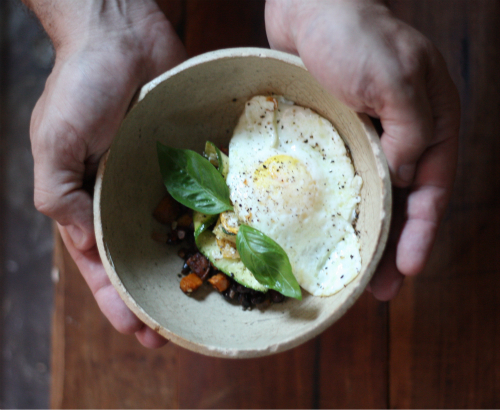 This sounds like such a perfect meal for fall. 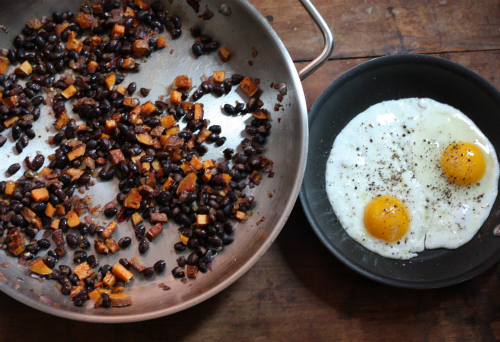 Sweet potato and black bean is clearly a match made in heaven--especially with a runny egg yolk! Can hardly wait to try it! I hardly ever have those leftover in my fridge though...darn...I will just have to go out and buy them! Julia, thanks so much and I am sure it will be a hit! Thanks for dropping in! Just made this plate this morning. AMAZING! I'm not a fan of sweet potatoes so I used a regular potato instead and added a few extra chipotle peppers to give it extra heat. This dish was delicious!